Traquair | Beer Apprentice - Craft Beer News, Reviews, Interviews and Info. Hello guys!!! It’s time for another craft beer review!!! Today I have the pleasure of trying the Traquair House Ale produced by the Traquair House Brewery Lld located in Peeblesshire, United Kingdom (Scotland). This brew is supposed to be one of the best, so, needless to say, I can’t wait to give it a go. From the website, traquair.co.uk, we find this little description of the brew. The original ale first brewed in 1964 and now sold all over the world. Perhaps the distinctive Scottish ale on the market and with its rich dark oakiness, this is a serious winter ale. Well, obviously, it’s not quite Winter yet, but who cares? I’m jumping in with both feet anyway. This Ale has an ABV of 7.2% and comes in an 11.2 oz. bottle. The appearance was of a very dark mahogony to dark brown color. I could see no highlights around the edges of the snifter. The pour produced a light tan colored head that was of only average size, yet smooth and lightly creamy. I thought the retention time was only average also. The lacing left behind was thin, but consistant. The nose on this beer was wonderful. It started with deep, dark fruit tones of figs and raisins followed by subdued “oaky” hints and waffs of buttermilk. Maybe even a touch of vanilla bean mixed in nicely with a peat “smoke.” Light hints of spice in the form of coriander. Only when the brew warmed considerably did I ever find any noticeable hints of alcohol. This beer has a superb fragrance that was well balanced, complex and harmonized. The taste imparted more of the “oak” flavors than did the smell. A very malty backbone combined with some “earth” and dark, fruity figs made for a pleasant savor. I noticed the buttermilk again, however it started to lean ever so slightly toward an evaporated milk flavor (like the kind people put in coffee). The spiciness did not seem to be very forthcoming. It’s there, but very light I thought. Once this brew warmed and started to “breathe”, the flavors became more prominant. A very nice taste here. It’s different, but good. The mouthfeel was a sturdy medium. Smooth, slightly chewy and creamy. A decent amount of flavor coated the palate and discharged a slight warmth, although no burn was noticed. Without a doubt, this is a very, very good beer. The aroam was outstanding (the best part of the beer for me). I think I would enjoy this more as a sipper than anything else. It’s not a beer I could make a night of nor is it a brew that I would want on a regular basis, yet to have one or two during a session would satisfy me I think. For sure pick this up if you see it because it’s a very well made beer that would be an excellent change of pace for any craft beer enthusiast. 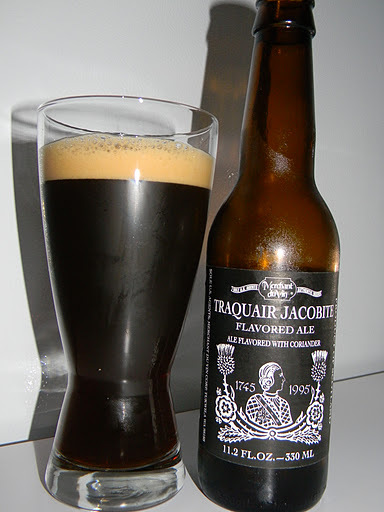 Have any of you guys had the Traquair House Ale? What did you think of it? Thanks for reading and commenting. I hope all is well in craft beer land.